The Association has a teaching apiary at the Marlborough School in Woodstock which boasts a custom-made workshed, fully equipped to meet the needs of beginner beekeepers including study for the BBKA Basic Examination. The Woodstock Teaching Apiary is managed by Kevin Mewis and Jonathan Clark. Within the Woodstock apiary stands a Bee-bole, which serves to remind newcomers to beekeeping that it is an ancient craft on which they are embarking. The Bee-bole also highlights the development of bee management techniques, from skeps to the modern hive, as well as pointing out the value of changing comb regularly. Adjacent to the teaching apiary at Woodstock is the bee garden that displays the main species of plants that all types of nectar-seeking insects (including bees) favour. This extension to the apiary is meant to provide not only an educational resource but also an area where staff, students, members and visitors can relax and enjoy the moment. The Teaching Apiary is of course primarily used for the Introduction to Beekeeping Course. 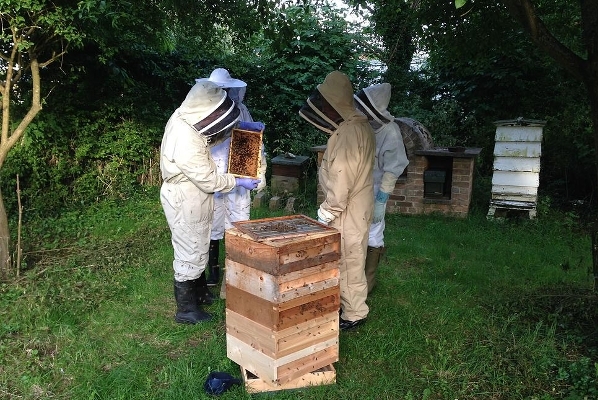 We also hold the Annual Taster Day at the Teaching Apiary; click on the link for more details.